It’s been a very good start to the day for European stock markets with the FTSE, CAC and DAX all up by around 0.6%. Yesterday the S&P 500 and tech heavy Nasdaq 100 smashed through resistance to record their highest levels for the year. Yesterday the FTSE 100 failed to hold the 5000 level but the overnight sentiment from the US is helping to fuel another surge higher. Today’s standout economic announcement is UK PPI at 08.30 GMT with a number of middle tier US economic announcements to follow in the afternoon. Perhaps it’s another sign of the effects of the credit crunch easing, but in the last few days, the dollar and yen have diverged significantly. Throughout the crisis and until recently, both the yen and the dollar were a good proxy for risk appetite with currencies such as the euro falling against both when investors become nervous. Now the yen has broken out of this pattern and is surging higher while the dollar is experiencing weakness. The dollar is down nearly 1% against the yen but for all the headlines about the weak dollar, it’s moves against other currencies has been less severe. Today’s move on the USD/JPY is all about the yen with the Japanese currency gaining by at least 0.7% against virtually every other major currency. The GBP/JPY has been relatively range bound for most of the week and today’s fall is bringing the pair towards the bottom of this range around 151.35. 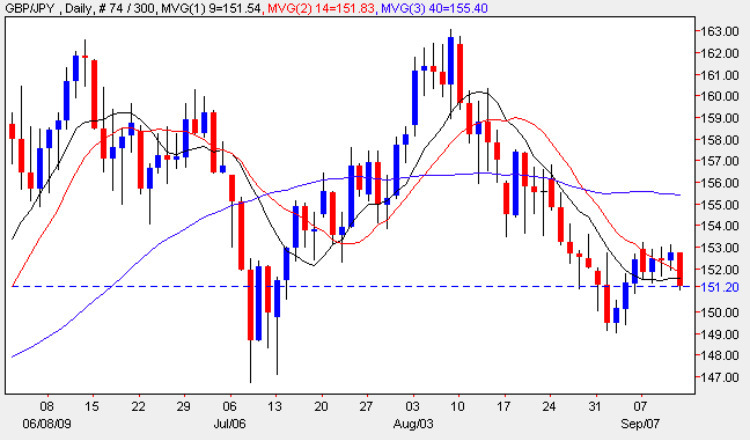 This makes the GBP/JPY today’s pair in play. The best way to play it, may be to wait for the price to get closer to the 151.35 level and make a double (up) trade predicting that the GBP/JPY will rise. Then yen is strong today, but the pound is holding up well against most other currencies so any downside for the GBP/JPY could be muted. In order to provide you with more help with your binary options trading I have recently added many new features to the site including live currency charts, the latest currency news and fundamental analysis on video every morning, live commodity prices, stock charts and index charts, along with a national holidays calendar, and finally if you are looking for a good ECN broker then please just follow the link.